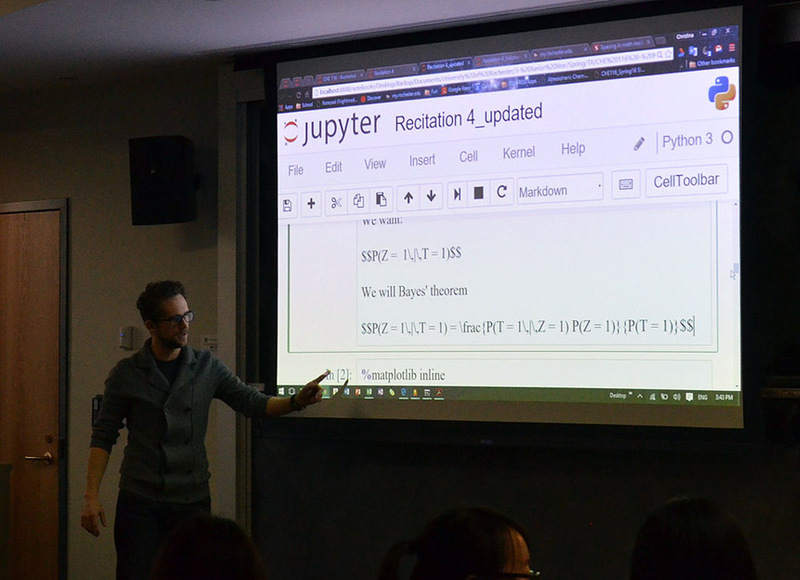 Andrew White, assistant professor of Chemical Engineering, calls up a slide show he created from course materials he has placed in Jupyter Notebook, an open source app accessible to students, in lieu of using a traditional textbook to teach numerical methods and statistics. Students in Andrew White’s class on numerical methods and statistics don’t have to laboriously copy an equation out of a textbook in order to solve a problem. In fact, they don’t need to pay $160 or more for a textbook at all. “I think this format is really going to catch on,” White says. 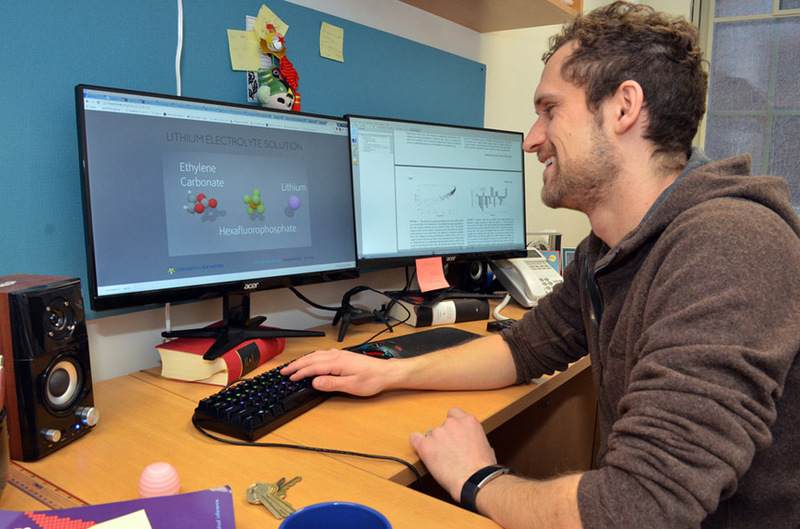 Eric Holmgren, a Chemical Engineering undergrad who took White’s course last spring, is also sold on Jupyter. “I have continued to use this program in other courses because of its capabilities in graphing, statistics, and data analysis,” he said. Among the institutional users listed at the Jupyter website (link to: http://jupyter.org/ ) are corporations such as Google, Microsoft, IBM, Bloomberg and Continuum Analytics; universities such as Berkeley, George Washington, NYU and Northwestern; and NASA. White says Jupyter is continually refining its app. Since he started using Jupyter for his class last spring, for example, it is now easier to do dynamic graphs, and to turn notebooks into slide shows. 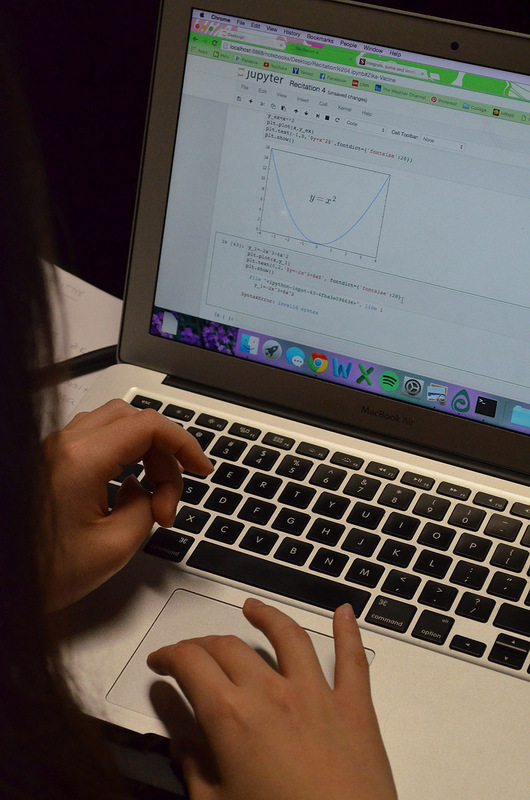 Initially operating only in Python, Jupiter now accommodates 40 other codes, including Matlab, the staple for Chemical Engineering. White is seeking outside funding so that students could access Jupyter on any computer maintained by the University, not just their own laptops. Yates says the department would then consider chipping in funds to maintain that access. As White gives his lecture, students are able to immediately interact in their Jupyter Notebooks, copying the equations White gives them, then plugging in their own variables to create graphics like the one below.